.pdf documents require Acrobat® Reader to view. Property information includes a picture, prior sales, a list of the survey, the tax value, and recent sales in the nearby area. 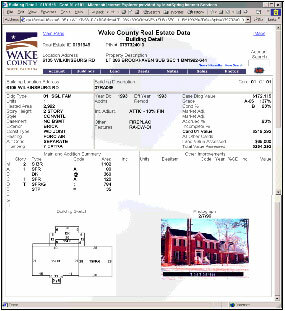 Choose "View Tax Bills" to see tax information or "View Parcel Data" to see statistics about specific properties. Information may be found with either first and last name or address. This site offers links to several related services, including Orange County Interactive GIS, a mapping utility, the old version of Interactive GIS, which includes tax information with properties that are found, and Master Orange Address Database. Search Johnston County property appraisal cards by name, address or parcel number. For more counties, see NCSU's list of mapping and parcel info websites here.